Austrian Presidential Elections - Does Updating the Voter Register Make a Difference? The announcement to postpone the October 2 Austrian presidential elections some days ago has triggered a debate about the question whether the voter register should be updated before the new election date in December. While the law does forbid any changes in the electorate from one round of the election to the next, the Austrian parliament yesterday passed a bill to allow this update to happen. Hence, teenagers that turned 16 between April 24 (first run-off) and December 04 will be entitled to cast their vote either for Norbert Hofer (Freedom Party Austria) or Alexander van der Bellen (Green Party). Taking into account these changes, the question arises which difference the adaptation of the voter register actually might have. According to Statistik Austria, 49 000 first time voters will gain their right to cast a ballot in the December 2016 elections. 45.600 teenagers turned 16 while approximately 3.400 (will) have received the Austrian citizenship in the 244 days between the two elections. Beyond these first time voters, the size of the electorate also changes due to other reasons, as e.g. a number of people will not be able to vote (approximately 45.000 people (will have) died until December 2016). These changes can be considered reasonable as Alexander van der Bellen won the annulled election of June 2016 by a margin of victory of only 30 863 votes (0.3%). 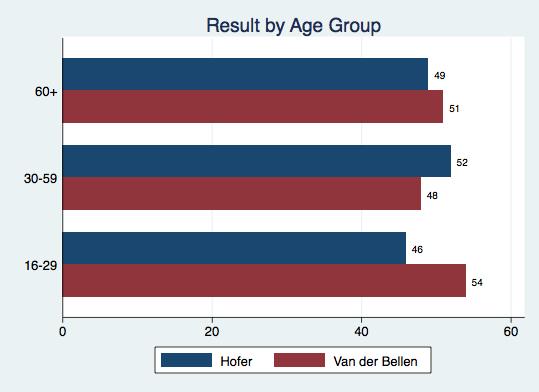 Graph 1 displays this result by age and shows that the youngest age group is the most divided: Van der Bellen received 54% of the vote among the 16-29 year olds, while Norbert Hofer only gained 46% of the votes in this group. This difference is more pronounced than in the other age groups (4 percent in the group of 30-59 and only 2% of the 60+ voters). 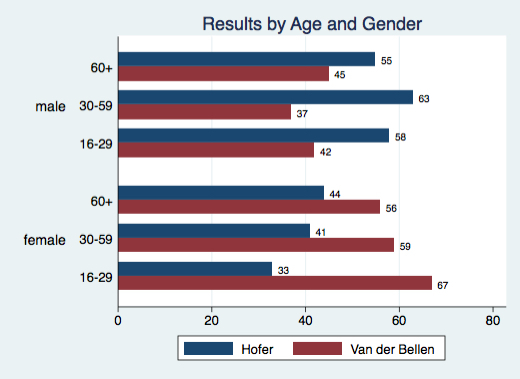 Splitting this result by gender, the second graph displays that Van der Bellen was mostly able to mobilize young women, while Hofer rather convinced men belonging to the youngest cohort. However, over all, Hofer received his best result (63%) among the middle-aged men (30-59), the group that will change the least from an updated voter register. These graphs suggests that if new first-time voters follow the same voting behavior as the youngest age group of 16-29 year olds, and the voter behavior of others remained stable, not to update the voter register might have disadvantaged Van der Bellen, as he was able to mobilize most voters from this group in the annulled second run-off. Unfortunately, the differentiation according to age is not fine-grained enough to conduct detailed analyses of the voting behavior of 16 year olds and does not allow for drawing well-grounded conclusions on which implications the update might have in detail. Yet, as the annulled election was decided by a mere of 30 8683 votes, this update of the voter register might make an decisive difference in the end.